The subject-matter of bats among clouds was a very popular one that is found on Chinese artworks in all types of medium. Bats, fu, are homophonous with the character for 'fortune', and therefore, a very auspicious symbol. On the present vase, the carver has cleverly utilised the russet-brown inclusions in the stone to highlight the bats. 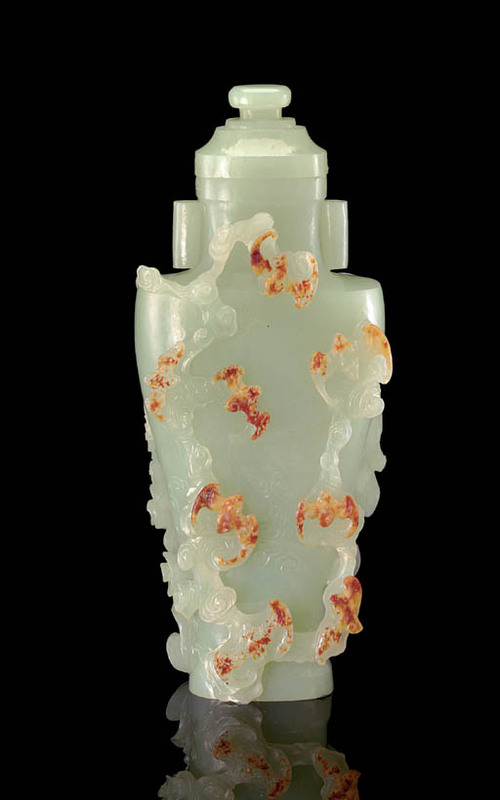 For other related vases with high-relief carving around the body, see Jadeware (III), The Complete Collection of Treasures of the Palace Museum, Hong Kong, 1995, pl. 63, a vase encircled by dragons, and pl. 67, another covered vase with prunus branches.